Numbers represent order of death. (L) denotes a player coming back to life due to Dead Man. 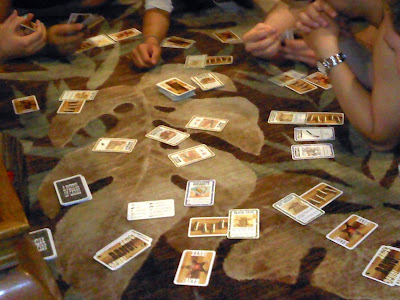 Played 20091216 Josh (Sheriff) Me (Outlaw)(3) Phuong (Outlaw)(4) Steve (Deputy)(2) Daniel (Outlaw)(1) Stephanie (Renegade)(5). Sheriff wins. Josh $4500, Steve $2100, Stephanie $2400. Played 20091218 Josh (Sheriff)(5) Me (Deputy)(4) Phuong (Outlaw)(3) Kevin (Outlaw)(2) Steve (Outlaw)(1)(L) Stephanie (Renegade) Daniel (Deputy). Outlaws win. Stephanie $2100, Phuong $3000, Kevin $3000, Steve $3000. Played 20100106 Stephanie (Sheriff)(5) Me (Outlaw)(3) Phuong (Deputy)(4) Josh (Renegade) Kevin (Outlaw)(1) Chris (Outlaw)(2). Renegade wins. Stephanie $600, Josh $9000. Played 20100112 Stephanie (Sheriff)(7) Kevin (Renegade) Steve (Deputy)(2) Me (Outlaw) (1)(L)(5) Josh (Outlaw)(3) Phuong (Outlaw)(6) Daniel (Deputy)(4). Renegade wins. Stephanie $700, Kevin $10500. Played 20100522 Kimmy (Sheriff) Steve (Outlaw)(2) Stephanie (Outlaw)(6) Me (Deputy)(4) Josh (Renegade)(1)(L)(8) Tiffany (Renegade)(3) Daniel (Outlaw)(7) Spencer (Deputy)(5). Sheriff wins. Kimmy $4500, Me $2100, Spencer $2100. Played 20110705 Joann->Me (Sheriff) Me (Renegade)(2) JoshK (Outlaw)(5) Stephanie (Deputy) JoshC->Chris (Deputy)(4) Chris (Outlaw)(1)(L)(5) Melanie (Outlaw)(3). Sheriff wins. Joann->me $4500, Stephanie $3000, JoshC->Chris $2100. Played 20120102 0003-0105PST. Me (Sheriff) Tiffany (Outlaw)(1) Michael (Outlaw)(2) Josh (Deputy)(4) Chris (Renegade)(6) Kimmy (Deputy)(5) Stephanie (Outlaw)(3). Sheriff wins. Me $4500, Josh $2100, Chris $2800, Kimmy $2100. Played 20120617 0009-0106PDT. Jon (Sheriff) Josh (Deputy) Me (Deputy)(2) Steph (Renegade)(5) Chris (Outlaw)(4) Joann (Outlaw)(1) Michael (Outlaw)(3). Sheriff wins. Jon $4500, Josh $3000, Me $2100. Besides Chris, it was our first time playing Bang. And this was just the original game, no expansions. We've played this game many times. They have played more than I have of course. And I think by this point, we can mostly tell who is what role by the way they play. The only thing that changes from time to time is an improved interpretation of the cards or rules. For example, one time we realized that there is a difference between Bang! and Bang! cards. During this game, Steve asked if there was a loophole with respect to one of the High Noon cards. I analyzed what the card said, and pointed out that it should only affect the player whose turn it is, not all other players. Though we kind of fixed it, I was still left wondering what counts as a discarded card. Looking up the rules just now, the card is played, the effect is resolved, and then the card is discarded. When playing with 7 people, there are two deputies and as such, it is dangerous to steal from the Sheriff even, because then both the Sheriff and the other Deputy will attack you. What happened was I punished Josh by taking one of his cards for helping Kevin and Steve on the premise of being good to him. But this put me on the bad end and Josh attacked me, and at some point Daniel attacked me. And then I think Stephanie killed me. Maybe Josh killed me. It's funny, because at one point, Daniel joked, "What if the Deputy took something from you?" And of course I have to go along with the joke, cause you shouldn't give away who you are. But Phuong knew I was a Deputy. Come on people... Haha. Q: Can you discard cards you don’t want, even if it lowers your hand size below the number of bullets you have? A: No. You cannot just discard cards you don’t want, even if they aren’t useful (such as “Beer” when only 2 players are left alive). Besides, it’s good to keep those “useless” cards because they provide some protection against losing a good card if you are the victim of a “Cat Balou” or “Panic” card. Q: Can you play a card that has no effect? Like a “Beer” card when there are only two players? Or a “Bang” card when everyone is out of range? A: Although the Guru doesn’t see any benefit from this, yes, you can play a card that does nothing. The card is essentially wasted. Q: Suzy Lafayette can draw a card as soon as she has no cards in hand. You’re allowed to discard cards at the end of your turn. Can she discard all her cards, draw one, discard that, draw another, discard that, etc.? A: Actually, discarding at the end of your turn is not a MAY, it is a MUST. You MUST discard down to your hand limit (the number of life points you have left, normally). You MAY NOT discard any more cards than that, even if you want to. if your Dynamite does not explode, pass it to the first player to your left who does not already have a Dynamite in front of him (no player can ever have two identical cards face up in front of him). Thus, with two players and two dynamite, if the Dynamite does not explode, then passing it to the first player who does not already have a Dynamite in front of him results in passing it to yourself. You lift the card up. The other player has one. Next to your left is yourself. And you no longer have one. So you place it down. Then when it got to Kimmy's turn... Kimmy was Sheriff and with her character she had 5 bullets. She hoarded plenty of equipment. With her ability she also got a lot of cards. 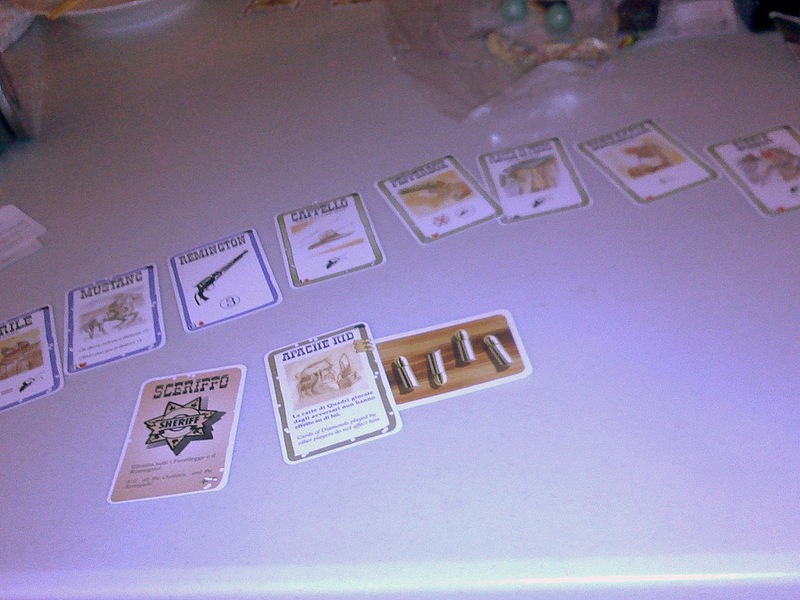 Then She killed Stephanie, an outlaw, for cards. Then Daniel. Then Josh. So Sheriff wins. Two small details regarding this game. First, we started High Noon a round late. Second, two players left early, which wasn't a big deal, since Chris and I were already dead and so we took their place. The only change to the High Noon expansion deck was adding in Dead Man from the A Fistful of Cards expansion. Jourdonnais the Outlaw (Chris) dies. Claus the Saint the Renegade (me) dies. I'm pretty sure Josh killed me with the equipment I gave him. (JoshC->Chris, Joann->me) Joann and JoshC had to leave, so I take Joann's place and Chris takes JoshC's place. Kit Carlson the Outlaw (Melanie) dies. Chuck Wengam the Deputy (JoshC->Chris) dies. Jourdonnais the Outlaw (Chris) lives! Willy the Kid the Outlaw (JoshK) dies at the hands of Claus the Saint the Renegade a Dead Man (me). Bill Noface the Sheriff (Joann->me) and Paul Regret the Deputy (Steph) celebrate victory. While Paul Regret survives, he definitely took a couple of friendly fire shots. The Sheriff doesn't play the game well and so just played it safe and weakened Paul Regret, just in case. Vera Custer (Tiffany) the Outlaw is killed by Apache Kid (me) the Sheriff for attacking him within the first or second round of the game. Lesson of the day: don't piss off the Apache Kid. Slab the Killer (Michael) the Outlaw is killed by (Josh). Calamity Jane (Stephanie) the Outlaw is killed by Sid Ketchum (Kimmy). (Josh) the Deputy is killed by Sid Ketchum (Kimmy). Sid Ketchum (Kimmy) the Deputy is killed by Pixie Pete (Chris) the Renegade. Pixie Pete (Chris) the Renegade is killed by Apache Kid (me) the Sheriff. the Renegade wins $400 for every player if he died last, leaving the Sheriff alive alone. the Outlaws, if they are alive, win $1000 for each Outlaw in the game, dead or alive; otherwise they win $800 for each Outlaw in the game. Joann, first to day, goes out with a bang, though I can't remember if she tries to take out Michael or Jonathon. Then by the time Josh and I figured each other to be deputy, he needed to kill me and take everybody's health down. Note that we didn't use the blue equipment cards and didn't play with High Noon (scenario cards). Overall I think this game of Bang! went quite well.